By upgrading to our Expert LCD Package you will be able to unlock and take full advantage of your digital signage investment. By harnessing all the internet has to offer, you can significantly increase the effectiveness of your Digital Signage to accomplish your goals. You will be able to easily incorporate YouTube, Vimeo, Twitter, RSS Feeds and a large number of other media sources to create dynamic, fresh and relevant content. This allows your screens to be continually up to date and can significantly reduce the amount of time and effort required to create and manage content. This web-based system will allow you to easily create and manage your content from any internet connected computer from anywhere in the world (no specialized software to install or worry about). This same web-based flexibility will allow you to place screens across different buildings and networks and yet work seamlessly without any additional configuration or setup. 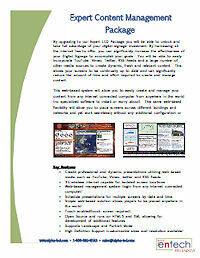 Create professional and dynamic presentations utilizing web based media such as YouTube, Vimeo, twitter and RSS Feeds. Schedule presentations for multiple screens by date and time.